There are several good reasons to grant anonymity. Journalists and police officers need to look after their sources if they want them to remain useful; in the world of counter-espionage revealing an identity could put an informer at risk; in my case, I stay secret because I don’t want any special treatment – no freebies or backhanders for me. However sometimes it’s best to grant someone anonymity just because you’re a generous-hearted sort of chap and you want to spare them embarrassment. That’s why I won’t mention the name of the person who suggested visiting this pub, or the chef responsible for the meal I endured as a result. I love getting recommendations for new places. It’s one of the perks of this job, and so I don’t want to put anyone off from getting in touch with a hot tip from the culinary underground. Many a culinary diamond has been unearthed after a solicitous email or DM. Sadly The Bluebell proved not to be one of these. The first warning came via text, as my friend arrived before me. “Jesmond Vale’s hidden gem”, as it calls itself, turned out to be a pretty bog-standard pub, complete with sports on the telly, a dull and limited selection of beers, a condiment station and that particular whiff that no amount of cleaning product ever shifts. 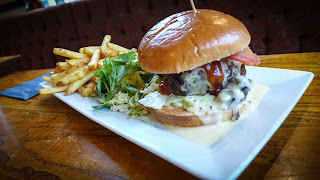 However, I had been assured that a new chef was doing good things, including a haggis burger. “Top notch grub,” shouted the website. I admonished my friend for being the horrendous snob that he so clearly is, pointing out that for all we knew this could prove to be Newcastle’s answer to Kent’s The Sportsman gastropub. I set my outlook-ometer to full optimism. Then the food arrived. 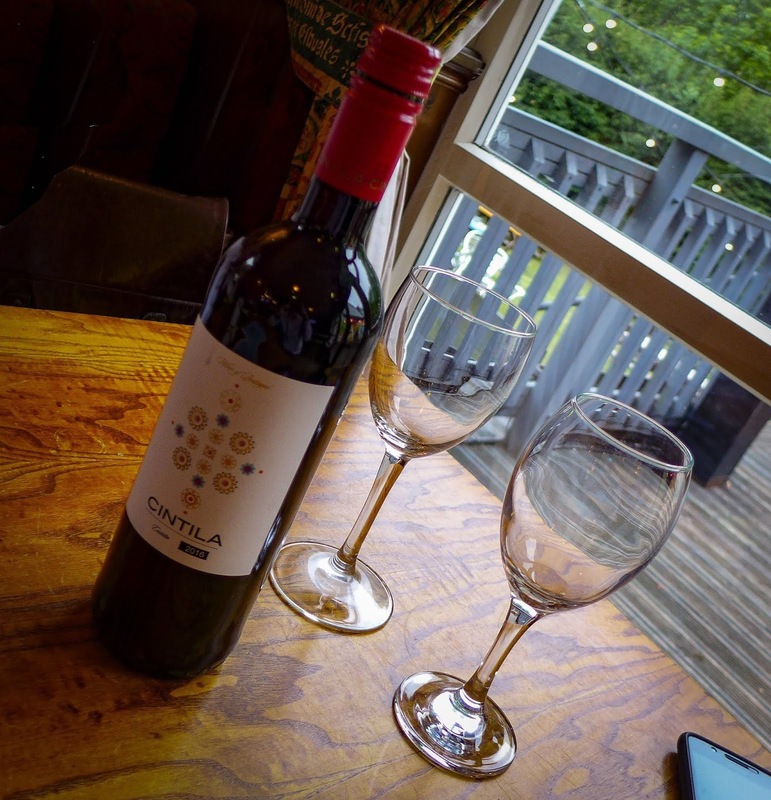 I can best sum up the puzzling, ferociously botched-up gubbins we were served by pointing up the disparities between what the menu said and what happened in reality. My Greek salad was meant to include cucumbers, and be dressed in olive oil. Wrong! 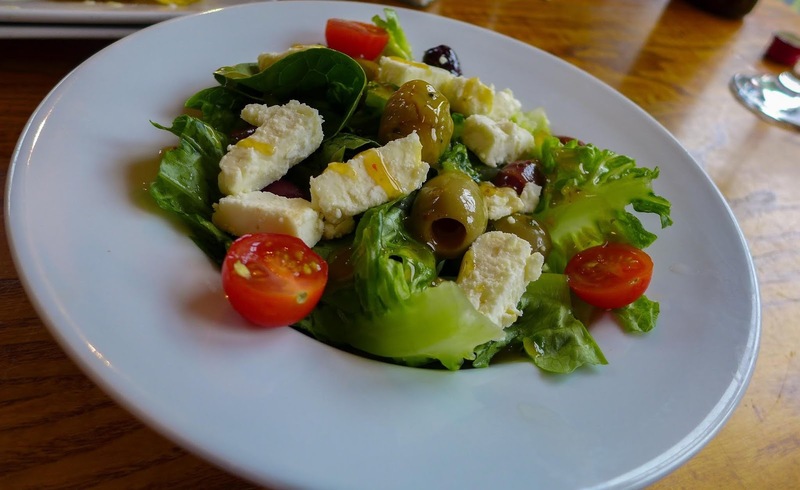 It was in fact a lettuce-based affair (no, no and thrice no! ), dressed in what I’m pretty sure was a sweet chilli dip. Ye Gods! Feta that had an off, blue cheese note completed this aberration. My ham, eggs and chips was billed as including a “a thick cut of locally sourced ham”. Na-aa! 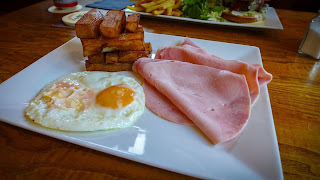 Alongside a jenga of terrible chips and two eggs (one of whose yolks had burst and gone rock hard) I got three thin slices of utility protein, perfectly circular as if just removed from a packet, itself not long liberated from the budget chilled meats section of who honestly cares where. As I lifted a piece from the plate, it fell back, making a sound like an angry wet slap. “That looks bloody disgusting. It’s pinker than your shirt,” said my friend, rather enjoying my discomfort. The menu said the cheesecake was homemade, so we ordered a slice. Wrong again! I asked if any of the four puddings were made in-house. None were. Either something has gone badly wrong since the printing of these menus, or the Trades Descriptions Act 1968 is being deliberately flouted to raise both prices and expectations. It isn’t hard to re-print a menu. Even when the descriptions were basically correct, the cooking very much wasn’t. I’d been advised to try the “Scottish burger” by my nameless snout. Our old friend the menu called it a “saucy treat from just across the border,” which made it sound worryingly like a stripper from Jedburgh, but we pressed on regardless. It came drenched in a whisky sauce that was possibly the weirdest thing I’ve ever put in my mouth. We are told the universe is infinite, so presumably there is a world where folk enjoy eating sickly sweet beige liquid, tasting rather like custard made from Elmlea fake cream, all over a tight, mealy meat patty. But it isn’t this world, and certainly not in 2018. 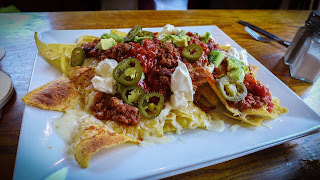 For completeness I should mention that my pal’s nacho starter was merely poor, as opposed to sub-atrocious. 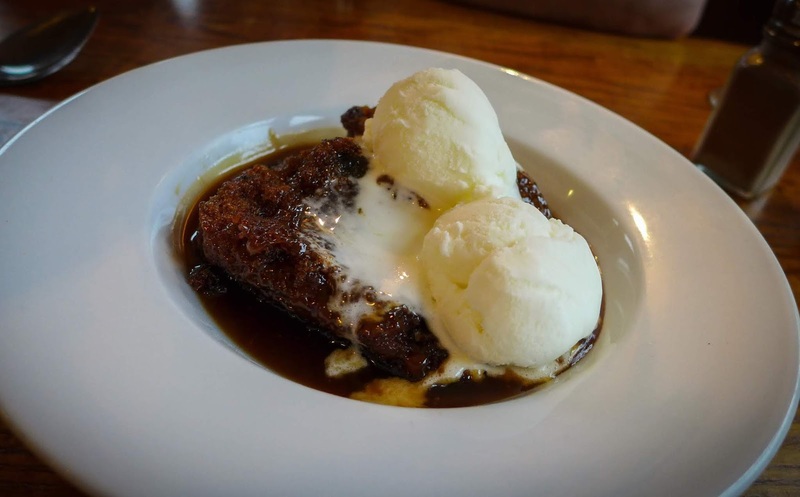 It came with chilli that tasted of nothing at all other than a bit of cayenne, but this, and the sticky toffee pudding we finished with, prepared off site by somebody or other, were the only highlights. In the valley of the damned and the damned hungry (most of our food went uneaten), the man with the microwaved pud that didn’t taste actively bad was King. These two dishes weren’t enough to persuade me that this meal deserved even one solitary star. 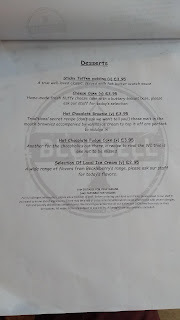 Thus the Bluebell joins the only other unstellared eatery in my eight years of reviewing the north east. That was a place in Northumberland called Goats On The Roof, which succeeded in serving me the world’s worst lunch back in 2013. Not even the goats mourned that restaurant’s passing. 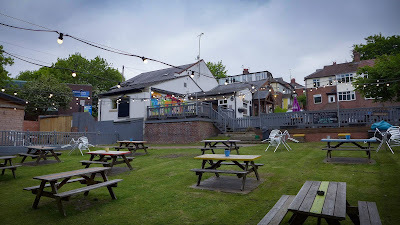 One slight glimmer amongst The Bluebell's depressing murk was the decency of the barman who fielded my ever-growing list of grievances with honesty and decency. He apologised on behalf of the chef and, without being asked, refunded a course. You might, like my companion, ask something along the lines of “What did you expect?” You might even accuse me of shooting big fish in small barrels by writing this up. I certainly won’t apologise for drawing attention to the fact that a meal costing over fifty quid for two people, with one bottle of very moderately priced wine, can exhibit such a total dearth of ability, either in terms of gathering raw ingredients or preparing them. So, thanks for the recommendation, E***e S******n. You know who you are and what you’ve done! 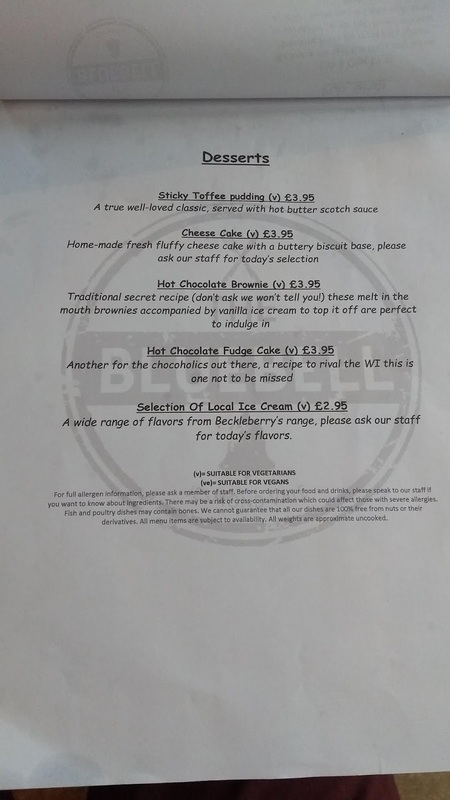 I’m actually wondering if you’re involved in the running of The Bluebell, because I can’t think why else you’d describe the food here as “amazing”, as you did in your email. And to the chef behind this meal: well, I’m giving you a free hit too on account of not knowing the circumstances of your employment here. The pub’s website describes an “award-winning chef”. I’m not sure if that's you, and if so, what this award was for, but I’d be very surprised if it was related to cookery. “How’s the review going?”, came the text from my friend later that night. “I feel really depressed. That custard burger has left me right down in the dumps”. Depressed is the right word for it. Depressed that food can be this poor, that a menu can be so honkingly wrong and that still punters turn up and pay for it. There were five or six tables eating, besides us, and as far as I could tell they seemed ok with what they got. Maybe they were visitors from that other world, where custard on burgers is all the rage. Unlikely, I know, but it’s the only explanation I can offer.